According to information given in the Unesco website, there are about 20% of the world heritage sites have some sort of religious or spiritual connection. At least thirty Hindu places of worship already listed in the world heritage site. Set aside the world famous Angkor Wat and Prambana, other Hindu temples in the prestigious list are Elephanta Caves, Kailasnatha Temple (Ellora Caves) and Konark Sun Temple in India, and Pashupatinath Temple and Changu Narayan in Nepal. 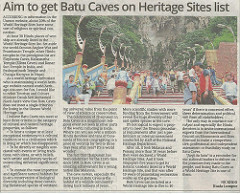 I as a world heritage enthusiast who is maintaining a world heritage website named world-heritage-site.com for fun would like to rebut Tourism and Culture Minister Datuk Seri Mohamed Nazri Aziz that Batu Caves is not meeting a single criterion for listing in the UNESCO world heritage site. 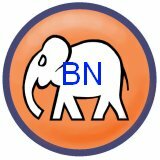 In my own assessment, Batu Caves has at least meeting three criteria in the category of cultural and natural heritage properties. · to be directly or tangibly associated with events or living traditions, with ideas, or with beliefs, with artistic and literary works of outstanding universal significance. ·to contain the most important and significant natural habitats for in-situ conservation of biological diversity, including those containing threatened species of outstanding universal value from the point of view of science or conservation. Thaipusam celebration in Batu Caves is a magnificent religious event not found in other parts of this world including in India itself. Where you can see over a million Hindu devotees and tens of thousand of tourists congregating in a worship place in two to three days year after year? It’s a world wonder! Thaipusam is celebrated for 125th times since 1891 in Batu Caves is an amazing achievement for a young nation like Malaysia. The caves system especially the Dark Cave in Batu Caves is the habitat of a wildlife community dating back around 100 million years. More scientific studies with more funding from the government will reveal the huge diversity of bat and spider species in the cavern. It’s laughable to expect a property can meet the UNESCO procedural requirements in the preliminary or internal assessment conducted by staff of the National Heritage Department. To recap our lost memory, Melaka and Penang took more than 10 years of preparation before being inscribed as a world heritage site. And it took Singapore five years for world heritage listing application process to make Singapore Botanic gardens a new world heritage site on top of another 15 years of painstaking restoration works on the botanic gardens. 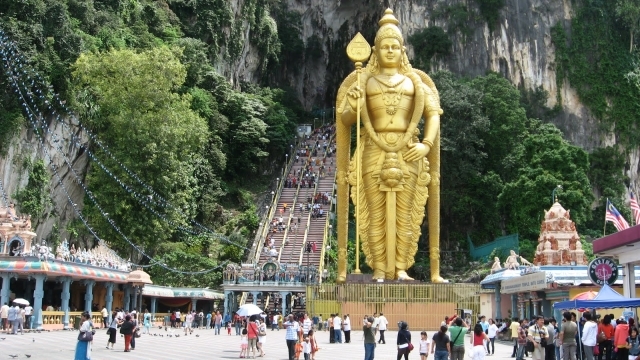 Batu Caves can be listed in the world heritage site in five to ten years time if there is a concerted effort, sheer determination and political will from all stakeholders. 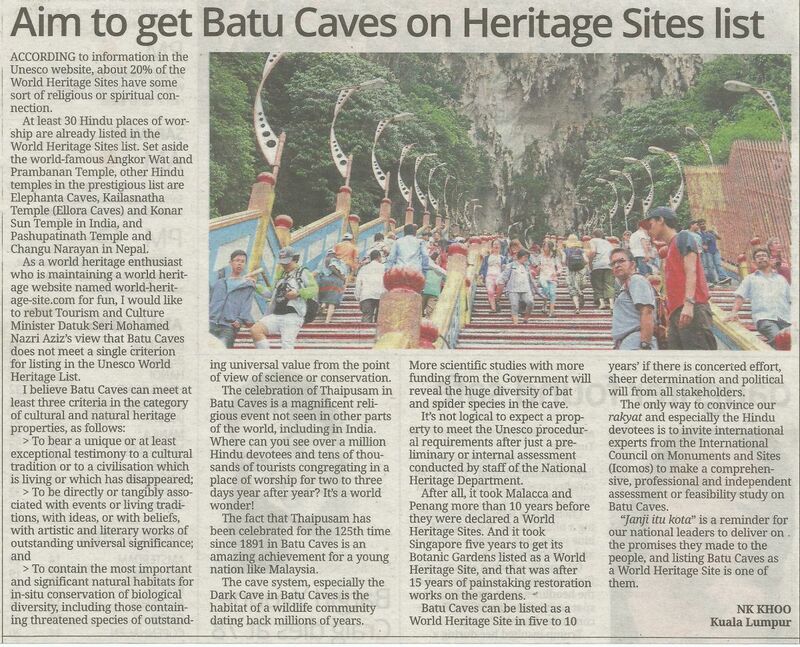 The only way to convince our rakyat especially the Hindu devotees is to invite international experts from International Council on Monuments and Sites (ICOMOS) to make a comprehensive, professional and independent assessment or feasibility study on Batu Caves. “Janji itu kota” is a reminder for our national leaders on any promise made to the people, and listing Batu Caves as a world heritage site is one of them.